Concrete is the most common and the most popular material used, now-a-days, in construction. It is abundantly available and can be molded into various shapes. While it has low tensile strength, it has high compression strength. Being alkaline in nature, concrete offers a non-corrosive atmosphere for re-enforcing steel. Get Dry Waterproofing Solutions offers high-quality services of concrete repairs in Sydney for structures that have come under a damping effect. Whether you are looking for strata type repairs or a large scale repair, we can be of immense help. Our purpose built machinery base is perfectly able to cater to your needs. In order to treat concrete issues, we remove the broken or damaged concrete and make sure that the steel that has been exposed is cleaned or replaced. We then use cement mortar or concrete to restore the treated area. 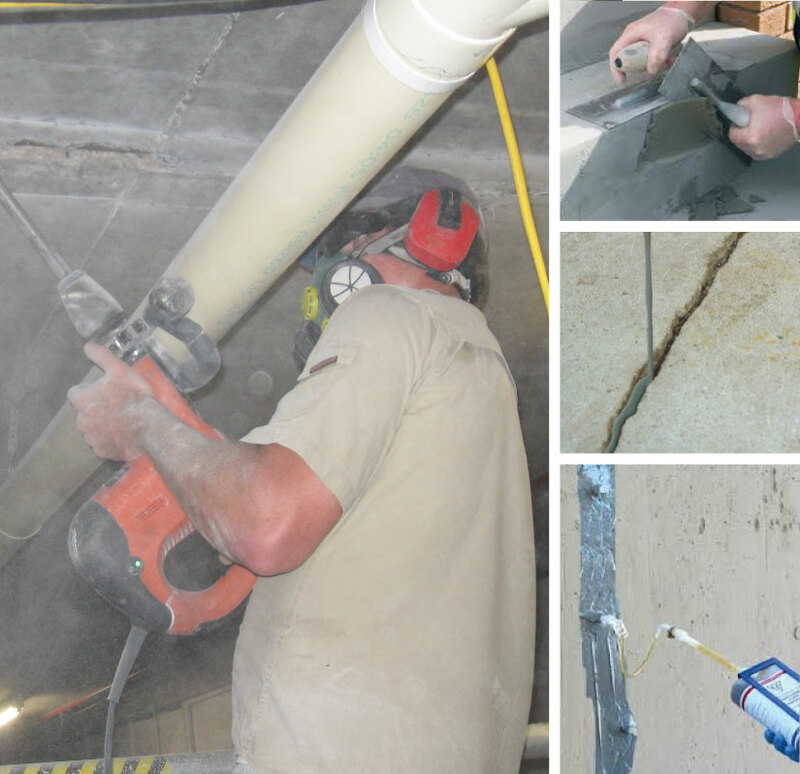 For treating cracks, we make use of special mortars, epoxy resins and injection techniques. Concrete is susceptible to damage through the egress of water into the structure, oxidising the steel reinforcement. This is known as rust to steel. This can be caused by various influences. Poor quality of concrete work causing porous concrete or honeycombing. Reinforcement steel with insufficient cover of concrete to protect it. Aggressive environment or exposure of concrete to: Chlorine Ion Attack- salt water-rusted reinforcement. Carbonation- attack from other chemicals other than salt water. Our Steel Reinforcement Repair and solutions of concrete repairs in Sydney follows several methods, like Dry Spray and Wet Spray. Dry Spray – If you want to repair concrete on a large scale, dry spray method can be perfect. With reduced wastage and rebound, and project-specific selection of material, we can efficiently deliver work. Wet Spray – A concrete repair material, prepared and mixed, is fed into a pump wet before being sprayed over the substrate. It is best known as a solution for medium to large scale repair work. During original construction or structure life-cycling, cracks often develop that allow water and pollutants to enter a substrate. They are often caused by too much of loading, mistakes in design and cracking caused by erosion. Each concrete crack has its specific set of characteristic features. It is essential to know all of them and use the right method. A proper and thorough service in crack repairs in Sydney is necessary to make sure that a concrete structure works as expected. We check and re-check all joints to see to it that there are no contaminants inside them that can cause any type of obstruction in the usual functioning of the edifice. With crack repairing services, we ensure that the entry of moisture is checked to a great extent, making the concrete less susceptible to get broken. If this cracking is non-moving (dead crack) but structural it is repaired through injection of a low-viscosity epoxy. The epoxy seals the cracks and restores the structural nature of a substrate. If the cracking is moving (live crack) a polyurethane injection system is applied. These materials are hydrophilic which can expand from 7 to 20 times in order to fill these moving cracks. Get Dry is the leading concrete repairs Sydney business with only the highest trained and professional staff. If it’s steel that needs repair or removal and replacing or cracks to be taken care of be assured we use the highest quality materials and systems available for any given application. Through years of experience, we have gathered deep insight into the environmentally aware methodologies that make sure that the social responsibilities are adhered to. We have a detailed understanding of the mechanism of concrete damage leading us to implement the best fit solutions for each issue, right from the core. Call us for free no obligation quote and advice for our concrete repairs in Sydney service.